The original Chardons building was started way back in 1986 by King’s Ski Club, an early ski travel company set up in the 1980’s catering mainly to the then-booming student skiing market. 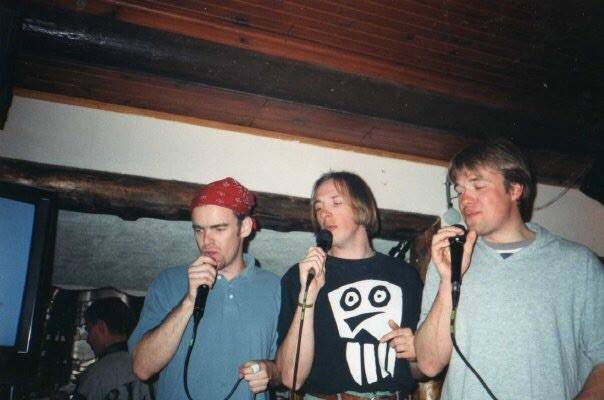 The founder of Chalet Chardons Ski Company, Mark Hayman, came to the Alps in late 1989 to work as a DJ in a nightclub in Montgenevre in the Southern Alps. Enjoying the climate, sports and new-found freedom of France, Mark worked another season in Les Carroz, in the Northern Alps before settling into Val d’Isere working as a handyman/electrician for one of the biggest players in the market at that time, Bladon Lines. Whilst working at Bladon Lines he took the opportunity to observe their business, catering, staffing and operating models and germinated the seed of an idea to start up one day on his own. Bladon Lines grew very quickly in the late 80’s and were famous for their concept of staff and customers mixing on an informal and friendly basis. 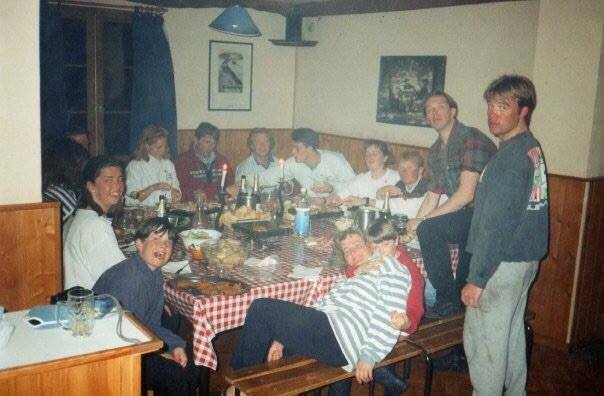 They pioneered what was then known as ‘ski guiding’ and later ‘ski companions’ and the chalets were run in a collective and relaxed manner, both for staff and skiers and snowboarders alike, who all shared a passion for mountain sports and the very special social environment that ski resorts offer. Mark very much took to this lifestyle and might have stayed with them for a long time but tragedy struck when the founder, Mark Lines, lost his life at an early age. Without its founder the company slowly lost its way and was finally swallowed up by another of the bigger, but much less fun, ski companies in the mid to late 90’s. Whilst working for Bladon Lines Mark had met and become friendly with what would become his future British Snowboard Team training partner and mentor, Lloyd Rogers. 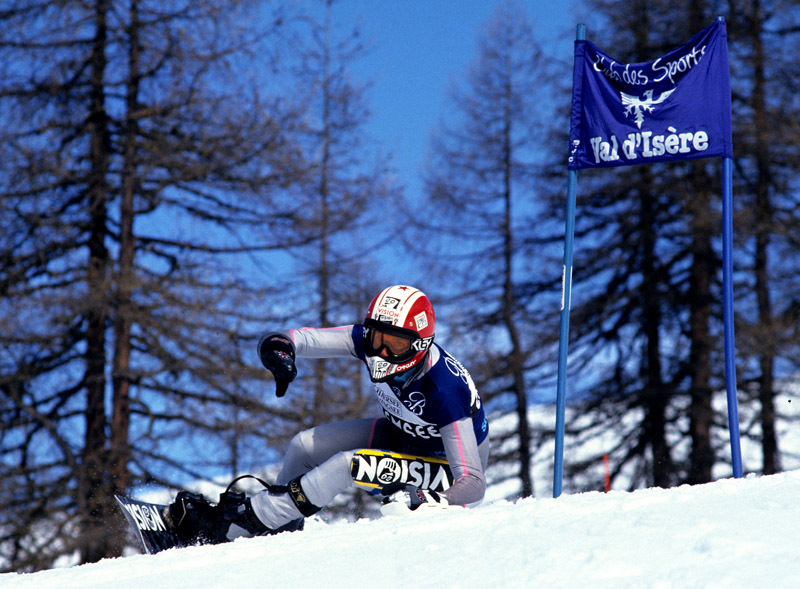 Encouraged by Lloyd, Mark attended the British Snowboard Championships in Andorra in 1992 and came away with creditable top 5 performances in Slalom and Giant Slalom and a podium in the Super-G, finishing with a bronze medal. Using contacts made through Bladon Lines he secured sponsorship from a host of high-profile companies including Oakley Eyewear and Santa-Cruz Snowboards for an attack on the World Cup circuit in 1993. In the meantime early season work was found in Tignes Les Brevieres in what is now the Intersport ski rental shop to finance the many hours of training required on the glacier and the gym to be ready for top flight snowboard racing. Through the next few years Mark continued working for Chalet Chardons who, in turn, allowed him time off to pursue his racing and sporting ambitions. Mark, by now working with Olympic-Gold Lens winner and Extreme Sports Photography founder, David Spurdens, also did a lot of photo work. 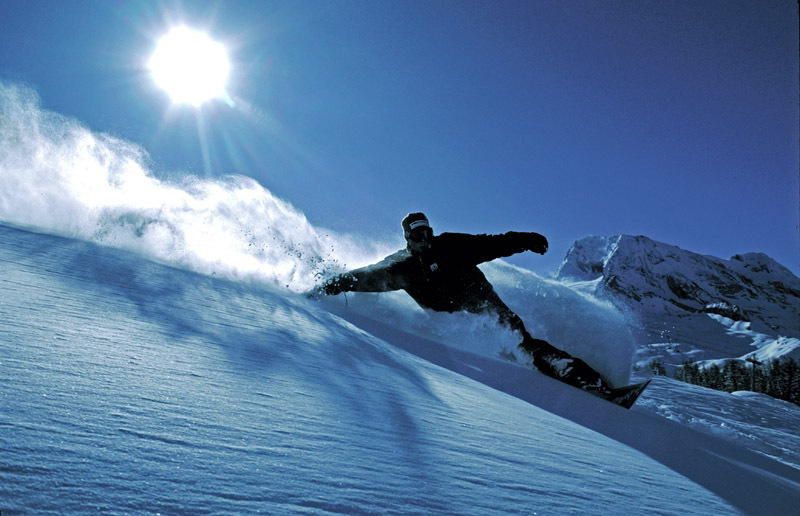 Highlights included the front cover of Snowboard UK, The Sunday Express Sport section and many articles and pictures produced in a range of industry magazines such as the Daily Mail Ski Magazine, White Lines and Fall-Line. He also continued competing with success on both the International and Domestic racing scenes. Towards the end of 1997 the Chardons came up for sale. Remembering the lessons learnt from his time with Bladon Lines and realising that injuries and age were stacking up against him, Mark decided it was time to set up on his own. There was one problem – the usual one – no money. With more confidence than was probably warranted Mark put together a ‘no money’ deal to buy the business promising to pay the owner over ten years from future earnings and, much to his surprise, the offer was accepted and Chalet Chardons ski company was up and running. He still says to this day that they must have been desperate..! Initially the business was tough. Heavy loans to pay and relying on travel agents and tour operators to fill the beds meant money was tight. At this point Mark decided to harness the growing power of the internet plus his earlier skills of writing computer games – a useful source of money during his teens – to get the Chardons website up and running and, crucially, find-able on search engines. Suddenly business was transformed with direct sales coming in and the ability to offer customers exactly what they wanted from start to finish, not whatever the travel agents decided to tell them to get the sale. The Chardons concept of selling via a website and dealing with all aspects of the in-resort experience whilst allowing customers to arrange their own transport via the other early-2000’s boom industry, no frills airlines, was born. By late 2009 Mark, who is by nature more of an entrepreneur and risk-taker than a manager, was finding it hard to deal with the administrative burden that comes when a company gets beyond a certain size. His previous partners also decided to go in another direction and the future of the business would have to change, or stop if no solution could be found. He also, true-to-form, had found a second sporting career as a member of the British Paragliding Team and was spending half the year travelling around the world competing in flying competitions, most notably the World Championships in Mexico in 2009. It was becoming clear that finding enough clients in-resort was not going to be possible and that, equally, working with Tour Operators from the UK meant taking an unacceptable hit on our ability to control the quality of the holiday. The solution, it turned out, would be a fortuitous meeting with an ambitious future-partner who was keen to start their own tour operation in the UK to connect British skiers and snowboarders to French ski chalets. What was needed was someone who excelled in steering and managing a company once it grows beyond the early phase and, in a lucky exchange with a property lawyer looking to do a ski season in her camper van via an online forum, Clare Knowlson and Mark were introduced to one another. 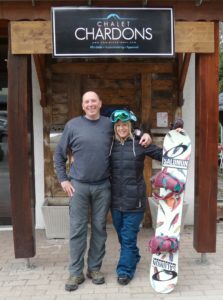 Clare initially came to the resort to run a very exclusive chalet operation and, in the same way Mark had done twenty years earlier, she soon got to observing how it worked and what could be improved. Two years after meeting, Clare finally managed get Mark to agree a deal that would allow her to transform the business towards the vision she had for it and to take it to the next level in its development. Anyone who knows Mark will know this was not easy..! A deal was struck and Clare, using her previously gained skills in British legal practice, set about creating Chardons LTD in the UK which would take over and expand the concept of Chalet Chardons and offer chalet holidays to our mainly UK clientele from a base in the Bristol Area. As we have grown over the last few years with new chalets and new concepts Clare keeps everything under control and in compliance with the many regulations a modern business must navigate on its path to success, as well as providing new ideas that keep us constantly improving and innovating. We have recently set up technology-based staff training solutions, renewed our website to incorporate mobile device adaptation, transformed our working practices and systemised our entire operation from buying the bread to our international corporate structure, all thanks to Clare’s reforming zeal, tenacious drive and organisational ability. During the Summer, she keeps our UK sales, marketing and web management team very busy as well as interviewing and recruiting all the staff required to keep the operation going. In the Winter she commutes between the UK and France to keep an eye on the French side of the business and, once in a while, to go skiing. Whatever the past has held it is safe to say that the future will require constant attention to the various challenges which face us including recent changes to the UK’s relationship with Europe. We know that you, the customer, are the reason for our existence and you will always remain not just our number one priority, but our only priority. Our new direction is towards higher-end chalets where we use our experience to deliver class-leading winter holidays that now dominate review websites at excellent value for money prices and with the informal and unpretentious atmosphere that we are famous for. We’ve been here for 25 years and hope to be here for another 25, innovating and leading the way in friendly, relaxed, proudly-independent and affordable ski and snowboard holidays. Whatever else we are, we are most certainly a company with plenty of personality – something that will not be changing any time soon.